Have you ever wanted to learn how to get that amazing wildlife shot? Here in Alberta we are lucky enough to share our spaces with so many animals iconic to the Canadian identity. With professional wildlife photographers, Wolfgang and Julie of JaW Nature Photography Ltd., join us for one of our WILDAdventures Photography experiences. Search for fascinating wildlife, witness amazing Alberta scenery, and learn some tricks of the trade while being responsible stewards of our wildlife! Besides educating through the Wildlife Hotline, WILDNorth is implementing an education program about living with urban wildlife. The goal of the WILDNorth’s Healthy Backyards Program is to empower members of the public with the knowledge necessary to ensure safe interactions with the wildlife that also call Edmonton home. Each individual has a role to play, and they can begin in their own backyards. Healthy backyards lead to healthy communities! No matter what our views on urban wildlife are, we need to challenge ourselves to find new and innovative ways to minimize negative interactions with the wildlife that call our cities home. Education is the first step. *Each presentation will be customized slightly based on your community! We have an exciting new program! 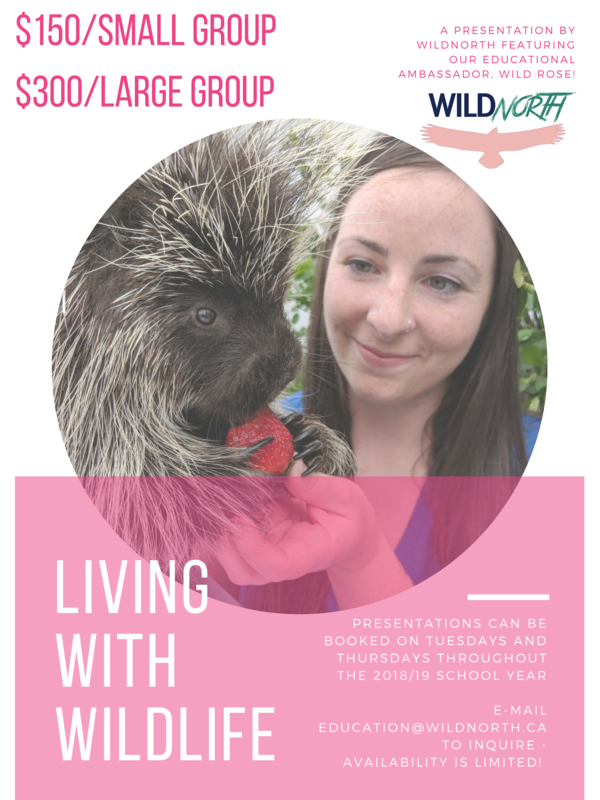 WILDNorth is offering presentation with a live wild animal ambassador; Wild Rose the Porcupine!